Captures a hilarious moment from the "Attack of the 50-Foot Eyesores" segment of Treehouse of Horror VI. 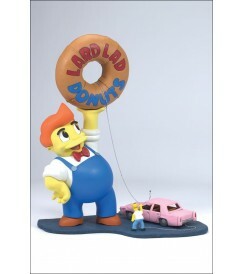 In the episode, when Homer steals the enormous donut that Lard Lad holds over his head, the massive mascot comes to life and hunts Homer down, demanding justice. This all-inclusive boxed set includes articulated Homer with interchangeable masked and unmasked heads, Lard Lad with arm-swinging, mood-changing play action, and getaway car. Lard Lad figure measures 8 ½ inches (21.60cm) at highest point on head; articulated at shoulders and eyebrows. When lever on base is moved, left arm and eyebrows move as Homer tugs on chain. Donut is 12 inches (30cm) high, 5 inches (12.70cm) in diameter. Base includes ¾-inch (1.90cm) Homer figure with alternate “disguised” head, and car measuring 1½ inches (3.80cm) tall by 5 inches (12.70cm) long by 2 inches (5.10cm) wide. Base is 11 inches (27.90cm) wide, 6 ½ inches (16.50cm) deep and 5/8 inches (1.60cm) high.